An autoimmune disease occurs when the immune system fails to recognize the body’s own tissues as ‘self and mounts an attack on them. Disorders include rheumatoid arthritis, juvenile (insulin-dependent) diabetes, thyroiditis and multiple sclerosis. Illnesses are divided into those that affect just one organ (organ-specific) and those which affect many systems (organ non-specific or multi-systemic,. Autoimmune diseases are mostly of unknown aetiology although genetic, hormonal, microbiological and environmental factors are known to be implicated in their manifestation and severity. 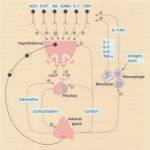 Formation of autoantibodies may be a normal physiological process. However, excessive production of such antibodies can be harmful. The way in which autoantibodies cause structural damage to the body’s tissues are varied. 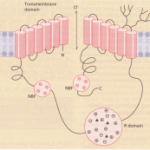 Antibodies may directly react with a specific tissue resulting in inflammation and tissue damage, such as anti glomerular basement membrane antibodies in Goodpasture’s syndrome, or directly affect function, for example acetylcholine receptor antibodies in myasthenia gravis (type II hypersensitivity). Alternatively, circulating immune complexes may be formed. Immune complexes are biologically active entities which in themselves have certain characteristics. 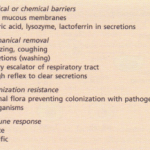 These properties determine whether immune complexes become harmful and cause extensive tissue damage. Some of these features are detailed. Inflammation or autoimmune conditions resulting from the formation of immune complexes are classified as type III hypersensitivity reactions. The complexes are often deposited in the kidney, skin, joint and nervous system. This results in complement activation, accumulation and activation of neutrophils with the release of proteolytic enzymes and further damage. 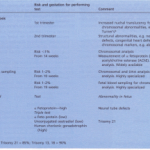 It should also be noted that mononuclear cells are also implicated in tissue destruction. Both CD4+ and CD8+ lymphocytes are observed routinely as infiltrates in inflammatory lesions. While there is little doubt these cells contribute to tissue destruction their precise role in the pathological processes is uncertain. 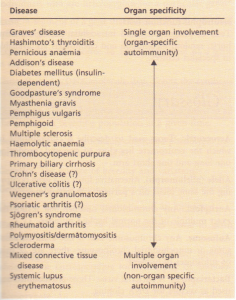 The complexity of the autoimmune diseases is quite formidable, largely because there is so much variation in the interplay of different factors that can influence the reactivity of the immune system to the body’s tissues.